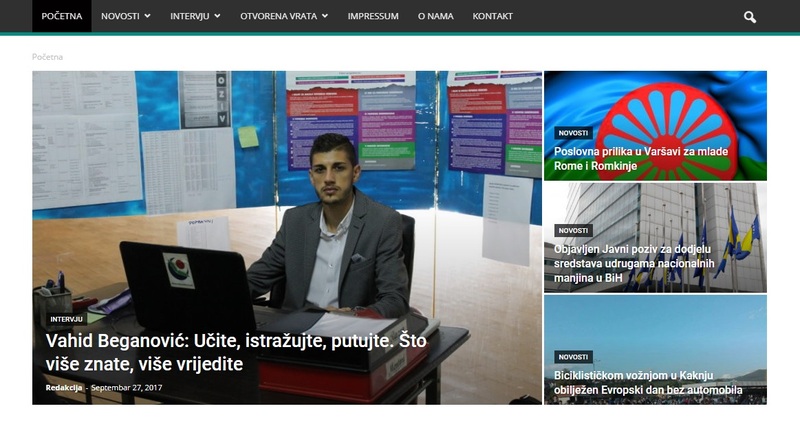 A Sarajevo-based Roma web portal dubbed UDAR has been active in Bosnia and Herzegovina since June http://www.portal-udar.net . The word “UDAR” means “door,” which has a symbolic meaning because one of the portal’s goals is to open the Roma community to the general public. “The idea to launch the UDAR portal resulted from the need to offer information to the public, both general as well as Roma public, on all that is happening within the B&H Roma community. On the other hand, UDAR is a response to the program policy of public broadcasters in B&H, which have not as yet recognized the importance of launching a newsroom that would produce program for Roma and in the Roma language,” the editor-in-chief, Dalibor Tanic, told the SEENPM web bulletin. After several months of education, implemented in four cycles, a team was created out of reporters who successfully completed the program of basic journalism training. These young journalists/reporters agreed at the end of training that their common mission would be to show a different and more objective image of Roma, but also to criticize all those who are responsible for the current position of Roma in B&H. “All of the portal’s reporters underwent intense and demanding training, which is practically not finished because they are all still in the education process. Everything that can be found on our portal comes directly from the Roma community or is related to Roma. UDAR is therefore narrowly defined, which is why from time to time we also publish information that is not necessarily Roma related,” said Tanic. Funding for the portal’s launch was provided by Open Society Fund B&H and Sarajevo-based Media Initiatives is the organization charged with implementing the program.